Today’s landscape is global and competitive. The demand is to implement Lean strategies accross the Enterprise. Our certified staff in six sigma, business process management solutions, Toyota Production System (TPS), and Lean practices ensures our clients achieve operational efficiency and effectiveness throughout their organization. 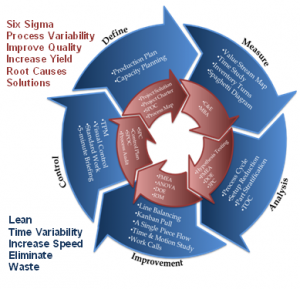 Today Lean Six Sigma (LSS) is hotter than ever. Our LSS approach looks deep into your organization to determine its actual quality verses the potential quality. The difference between the two is waste. We help you eliminate the waste. It’s not just about eliminating waste. Allons goes further; we infuse Lean principles into the organization’s DNA to continually streamline complex activities. While there are differences in the challenges of each type of industry possess, the fact remains that the core principles of Continuous Process Improvement (CPI) remains prevalent across industry and functions.